You can tell by the pig's face - look! Is there an easy way to tell if a sentient animal is experiencing what the scientists referred to as "positive states" or, as the rest of us would say, "is the animal happy"? There are those that say it is just as difficult to tell if an animal is happy as it is with some people, but science is giving us a few more tools to help us with that assessment. 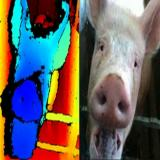 For example, scientists are using facial recognition technology to assess the emotional state of pigs.Previous studies have already already shown that pigs can communicate with each other using different facial expressions, and now researchers have been working out from a pig's expression whether the animal is content or distressed. The next step would be to develop a tool to monitor individual faces that would alert farmers to health and welfare problems. From a legal perspective, the tool might also prove useful from an evidential point of view as law progresses towards making it a responsibility to provide animals with opportunities for pleasure.